Some of you may be wondering what Libya, Gaddafi, and Wall St have to do with urban matters in little old Wellington, and to be honest, I’m wondering too, but you’ve got to question how we are ever going to have a decent revolution in the West if the best we can come up with is a poster that says “We’re not Happy, and we want someone to Do something about it”. Yes, I know, nobody is particularly happy, but then there is a world wide recession going on, which in New Zealand’s case may continue for another two years in the (admittedly, rare) event of the AB’s not winning the rugby this weekend. (Please, please win, if only so that we can get the economy back on track and get back to building something other than overpasses to nowhere). But really, if you want to other throw the installed capitalist system, then surely you have to try a little harder than camping out in Civic Square. Heads should roll! Remember Tahir Square in Cairo? Many many nights of massive crowds gathering, on the verge of rioting, and overthrowing the government is what is really required – certainly required over there, and quite arguably over here as well. Except of course we won’t, because there is a rugby game on, and that nice Mr John Key is simply going to smile and wave and showboat into the next government, although probably without either ACT or the Maori Party this time. Or in the case of Libya, months and months of hand to hand fighting through the desert, taking over the oil refinery not just once, but repeatedly, and calling in NATO air strikes to bomb the heck out of the evil dictator’s stronghold. I suspect that asking NATO to launch missiles against Key’s villa in Mt Eden isn’t going to happen really, but I’m also reasonably sure that a revolution in NZ won’t happen with a camping party. Neither is Occupy Wall St going to succeed if they spend their time playing tag with policemen in Times Square. People should be lying down in front of bulldozers and confronting the massed ranks of the oppressors right now, but, oh, that’s right – no one really knows what they are protesting about. 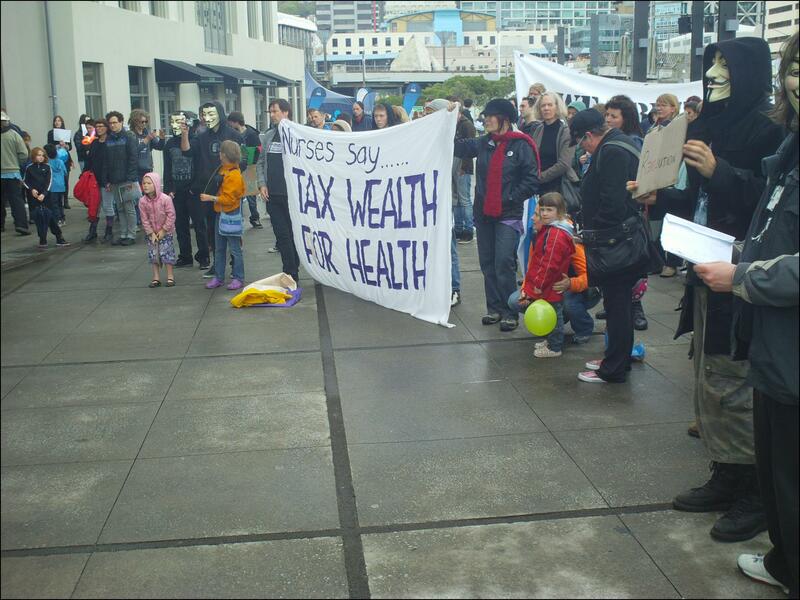 Placards on show range from a “We are the 99%” to a “Nurses say Tax Wealth for Health” and really, this is just the most disorganized rabble I’ve ever seen. Yes, yes, it is the self appointed duty of a rabble to be disorganized, for if it was organized, then I guess it would be more like… an army, I guess. Anyway – after a week, they’re going home? Is that it? Is that all we’ve got? They’re not going to go and hunt down fat cat corporate bosses in the wilds of the desert road? Oh, yawn yawn yawn, if you can’t even be bothered having a revolution, what chance is there for change?